Provide free inspections and discuss your Centreville home’s needs. Work to increase the value of your Centreville home. Offer extensive levels of customer support. Give you insight into how to communicate with your insurance company. Perform total roof replacements, repairs and regular maintenance to your Centreville home. No matter the reason(s) you hire roofing company team, the end result will be low on hassles and high on safety. We are all about satisfying customers when it comes to roofing services. Our roofing contractor company operates in Centreville, Virginia so call our roof repair and replacement services company now at (703) 345-0601. Our Centreville roofing customers include homeowners and businesses in Prince William County, Virginia. 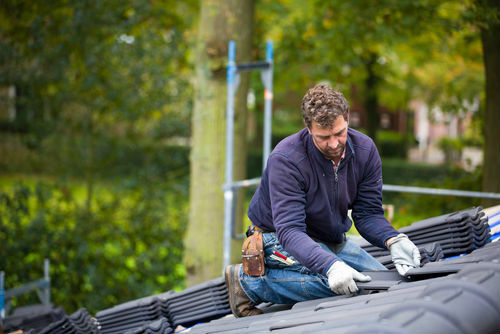 Whether you’re dealing with storm damage, undertaking a roofing replacement project to return your home to how it looked in the 1940s or overhauling the look of your commercial building, we’re in. All you need to do is contact our roofing company for a free inspection. We’ll learn everything we need to about your Centreville roof, and get the ball rolling for roof repair or replacement. In practically no time at all, you could have a new roof for your Centreville home or commercial building. One of the first things our roofing business does is inspect your roof. Even if your roofing project is relatively minor or the replacement is due to an emergency, we still inspect. Why? We do not want to overlook anything. We unearth any developing problems before they worsen with your roof. We may need to perform some light roof maintenance first. In short, our roofing company aims to treat true causes of roof damage instead of symptoms. Your Centreville home or your business is your greatest investment, and big roof decisions deserve careful thought. As a roofing contractor, here’s more on what we do for you. Keep your family or business secure for years. Use top-notch roofing shingles and other materials. Offer quality products like GAF Shingles. Provide great roof repair and replacement customer service. Treat your home as if it were our own. Prioritize safety, quality and job site cleanliness. Inspect your Centreville home or business roof for free. We’ve been doing roofing (repair and replacement) and more for a long time. Our roofing contractor business won’t leave ugly cigarette butts scattered around your yard. We don’t litter your grass with candy wrappers. We respect your Centreville home and act with professionalism. Unlike other contractors, instead of leaving litter, what we leave behind is a sturdy and solid roof. Is your roofing project a sure thing or merely under consideration? Either way, get in touch with us today. We’ll assess your Centreville roof system with professional, trained eyes to uncover your issues and deliver accurate solutions. Remember, our inspections are free, so you have nothing to lose. Mow your Centreville lawn the day before your roofing project. This helps make it easier to find any nails that fall from the roof. If the contractor uses a magnetized nail finder, short grass will make things much easier. Never pay in entire cost upfront before the job is finished. You might need to pay a quarter of the full price in order for the job to begin, but see if you can pay only that. You want to avoid having to pay the Centreville roof repair company the full amount to them to perform less work than what they were supposed to. Make sure the Centreville roofer you hire has experience. You might need to speak with people you know to see if they have any recommendations. This will ensure that you avoid a poor roofing job done which would result in costly repairs in the future. When you have your roofing contractors narrowed down, check with each in regard to their warranties. You want a warranty that lasts for at least 3-5 years. It should cover both defective supplies as well as poor workmanship, and they should also give you photocopies of manufacturer warranties too. Keeping your roof in good shape is a big part of being a responsible homeowner. While many aspects of home ownership can be put off and/or neglected, roof maintenance is not one of them. If you make use of the information here, you can avoid trouble in the future with your roof. Copyright © 2016-2018 by ﻿Ashburn Pro Roofing﻿﻿. ﻿﻿All Rights Reserved.